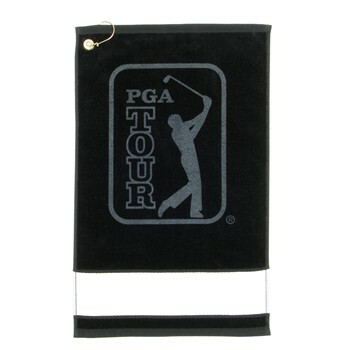 The PGA Tour® Signagraph measures 16" x 25" and is constructed of 100% cotton. The towel features a Brass Lock Clip™ and a printed PGA Tour® logo. The bottom banner can be personalized up to 25 characters. Nice quality towel. Embroidery work was fine. The towel is a very high quality product. It was shipped fast, but Fedex delivered it the wrong address and in the wrong state. That made it late for my golf trip. The towel is well worth the money. Got a PGA towel with my name on it. People always stop me and ask who I'm sponsored by when they see it. I just tell them the good folks over at Global Golf made this happen.